There has been a continued push on publicity, mainly through Facebook and twitter. 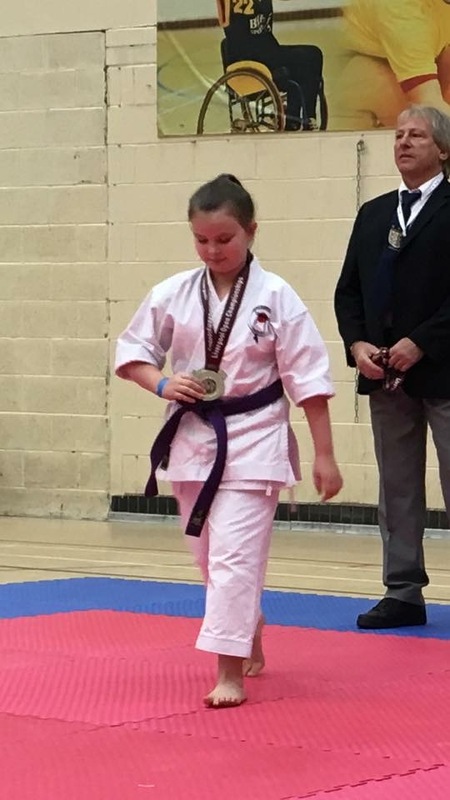 In the past, reports on various activities were sent to Rossendale Free Press to publicise successes at competitions, club gradings, and black belt achievements etc. We need to resurrect this and do more and look for other opportunities to be visible in the local papers – eg, raise money for charity etc. At the last year’s AGM we were not able to fill the position of publicity officer. If anyone is able to step forward for this position I’m sure they will get help from other committee members. Recently we did a demo at the Bacup and Stackstead Carnival. In addition to that we were invited to do a demo at the Laurels nursing home where we had arranged to hold our post carnival BBQ party. Unfortunately due to delays at the carnival and rain the demo didn’t take place. We have in the past done demos at the local schools at their open days and summer fayres. We need to re-establish contact with the local schools and offer karate demos. Club Mark Accreditation – Unfortunately we still cannot gain the accreditation as Karate is still not recognised by Sport England. Fund raising has mainly been carried out by Julie with assistance from other members and they spend a considerable amount of time to organise and attend any available events. They can always do with help at such events. Helpers don’t necessarily have to be committee members so if anyone is able to help please don’t be shy to volunteer! Halloween party, trip to the Panto, Christmas party for the senior members, a trip to laser quest in Rochdale for the juniors – but this year did not happen. In June this year a BBQ was organised and took place after the carnival. Although it was raining all those who attended enjoyed themselves. 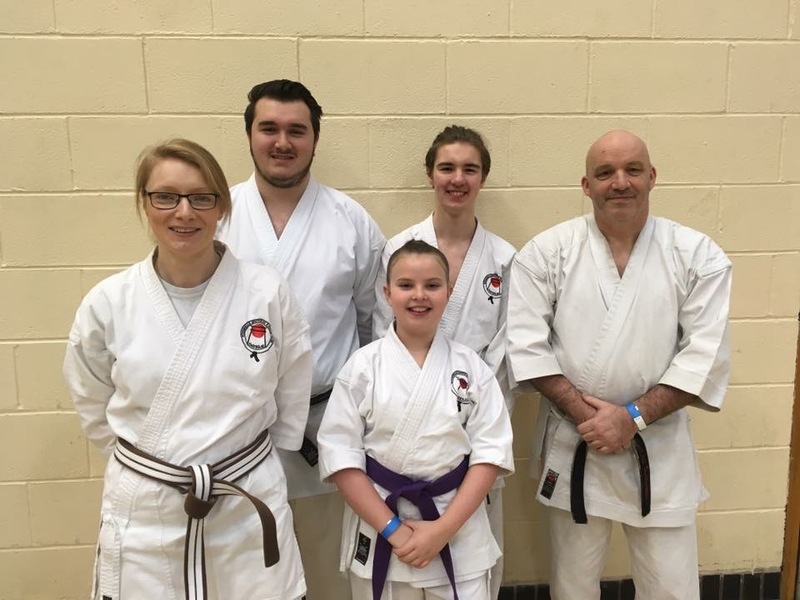 Rossendale Shotokan Karate Club held their annual Club Championships in June, where club members were pushed to their best, and the standard was high from all the participants. For many this was their first taste of competition and to their credit all performed extremely well. All in all it was a good day for all the competitors and spectators alike, so congratulations to all those who took part.This was also the first outing for our newly purchased floor matting. Last year we assembled a squad for external competitions and introduced regular squad training sessions on Sundays. This has carried on this year. Equipment was purchased especially for use during the squad training. This regular squad training has resulted in our members winning medals on a regular basis. Quite a number of competitions have been entered by the squad members with fair amount of success. In October last year we held our fourth Inter Club Championships and it was even better than the previous years. This year’s inter club championships will be held on Sunday 16th October at the Haslingden Sports Centre and its forecast to be even bigger and better. So please keep this date clear – help your club make this an even more successful. Tony Harwood became our latest member to achieve 1st Dan Black Belt. We currently have a number of 2nd and 1st Kyu brown belts whose names will hopefully be joining the list of RSKC’s growing number of black belts. We have held 3 successful gradings since the AGM last year, and each time the standard has improved. The membership numbers have stayed up and numbers at the kindergarten have been steady. and as such we need the help from all the members and parents to participate in promoting the club, and also in identifying ways in which we can improve and help find innovative ways of getting better. Rossendale Karate club’s, Tiger Cubs Kindergarten sessions for 4 to 6 year olds on Tuesday evening at Haslingden Sports Centre has been very successful and is getting stronger every year. Similar arrangements have now started on Thursdays at the AB&D centre in Bacup. This year has been another good year and things are still moving in the right direction. We have achieved most of the goals we set ourselves and had a number of successes. However we cannot afford to relax and we need to build on the successes we have achieved and set new goals. D. We have had some success in competitions and we need to build on this by encouraging more Members to take part. AGM for the Club will be held on Tuesday 21st July at Haslingden Primary school at about 7:30pm after a short training session. If you wish to take part in the AGM please make sure you attend on that day. 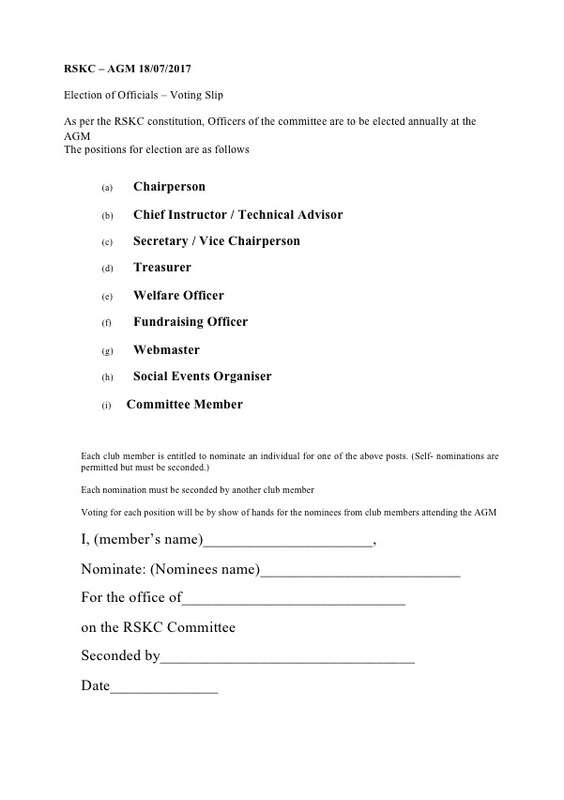 Nominations for committee members need to be submitted by the start of the AGM. Nomination forms can be picked up during the preceding training sessions in June and July. Firstly, the next grading will held on Thursday 27th February 2014. As some of you will be aware, the KUGB rules for anyone taking a grading are that to qualify members must have trained on average twice per week in a 3 month period or a minimum of 24 training sessions. Anyone wishing to grade up to and including 3rd Kyu must have trained at least 24 sessions in any 17 week period between gradings or at least 34 sessions in any 34 week period. Anyone wishing to grade between 3rd Kyu and including 1st Kyu must have trained at least 24 sessions, 12 of which must be Brown and Black Belt sessions, in any 17 week period between gradings, or at least 34 sessions, 24 of which must be Brown And Black Belt sessions, in any 34 week period. Anyone wishing to take a Dan grade must have trained at least 40 sessions, 20 of which must be Brown and Black Belt sessions in the 6 month (26 weeks) period prior to grading. Note:- All karate courses, e.g. KUGB Brown And Black Belt courses attended and competitions entered will count towards your grading requirements. To assist members and parents to keep track of attendances we have created a membership card which will be issued to every member, on which they must get each attendance initialled by the instructor. Also we have taken note of concerns raised by a number of parents that they do not get any progress reports until the actual pre-grades. Therefore we are introducing mini pre-grades which will take place every 5 – 6 weeks. At each pre-grade junior members may take a belt badge to show that they have achieved the required standard (75p per badge). The first pre-grade will cover the basic techniques required (Kihon) and students must have at least 7 attendances to take this. (Note that if a student does not pass their Kihon grade they can retake it at the second pre-grade). 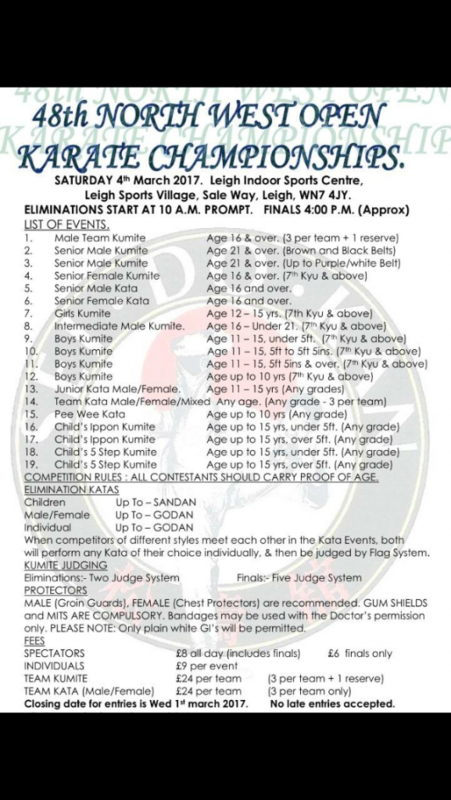 The second pre-grade will cover Kata and students must have at least 15 attendances to take this. The third pre-grade will be a full pre-grade the week before their actual grading. Students must have a minimum of 22 attendances to take this. By carrying out these pre-grades, students and parents will know if they are on track for the next grading and, if not, have had the feedback and time to improve in readiness for their grading. AGM will be on 9th July Tuesday 7:30pm at All Saints High School after Training. Please get your committee member nominations in NOW.